The winning flag (which I can’t stop seeing as a Corona beer logo) has been selling very well and is displayed in some volume in some neighborhoods around town. To me it’s something of a hipster thing but it’s being promoted as a symbol of pride and unity. The supporters of the ‘People’s Flag’ appeared before a common council committee and effectively got blown out of the water. Some media coverage for your reference HERE and HERE and HERE. From the common council discussion, it sounds like this proposed flag isn’t, at least in City Hall, a symbol of pride and unity. A lot of Milwaukee feels left out of the decision making process. And the flag doesn’t really say Milwaukee…a sunrise over a lake is pretty representative of hundreds of towns and cities across the nation. 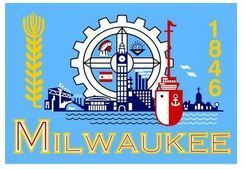 Should it be more Milwaukee? But after all of that background…why do we even need a city flag? Really. One Response to Why do cities even need an official flag? On this we definitely agree!